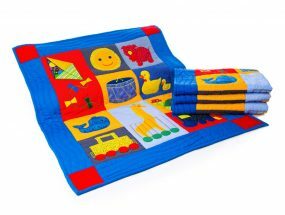 This traditional hand quilted Noah’s Ark Baby Quilt is a real keepsake to be passed down to future generations and is one of our best sellars. 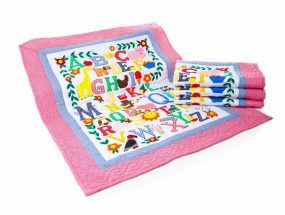 It doubles up as a playmat where you can put it on the floor and lay your baby down when tiny, a lovely wallhanging to hang on the nursery wall or simply as stated – a Baby Quilt. It looks lovely on single beds too. This gorgeous Noah’s Ark Baby quilt is a work of art and makes a treasured gift for a new baby. The attention to detail is stunning and when your little one is a bit older they can learn their animal names with you when sitting on it. It is made from 100% cotton with a polyester hollow fibre filling. They are completely machine washable, although should not be machine dried. All our quilts are handmade and hand quilted by a talented group of ladies in the Philippines.